The toddler years are a time of great cognitive , emotional and social development. Toddler word is derived from “ To Toddle “. Which means to walk unsteadily, like a child of this age. Toddler development can be broken down into a number of areas. We take care of toddler years development at this level. 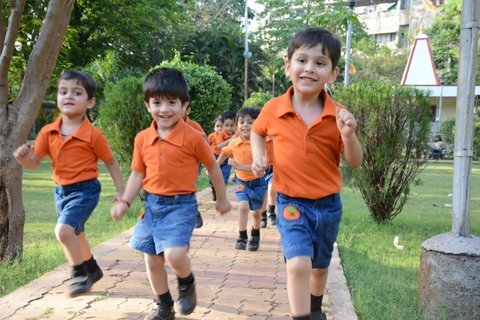 Preschool age years are a time of great cognitive, emotional and social development. We try to make students more interactive and confident. Drawing, clay activity, Water activity and many games like block building to inculcate drastic growth in fine motor skills development. Attractive Poems and story develops language and speech. Actions, Dramatizations, Puppets make the sessions attractive and interactive. Different types of competitions, festival celebration, Activities on regular practice helps for healthy emotional and social development. Writing and Reading skills are key factors for above development. Here, children learn to write basic alphabets - Numbers and develop reading skills with the help of phonics and numerical introduction. Recitation of Poems and story telling enables better comfort level with language and speech. This is age where children copies adult and friends. They start learning the concept of mine, my, his, hers, yours. They can express affection, anger, sadness, Happiness etc. We try to put values like sharing abilities, humbleness, thanking and being responsible. We cultivate self respect, self confidence, and respect towards others feelings. Yoga training and physical training practice takes care of physical development and instills physical discipline at a young age. We believe “Winners are always made not born” competitions are backbone of success. Our regularly arrange different competitions in order to nuture postive competitive spirit in the children. Every child is special and gifted with different skills.With Drawing, Colouring, Origami, Sticking, Rangoli making, Pottery, craft etc. we try to develop Children’s creativity.